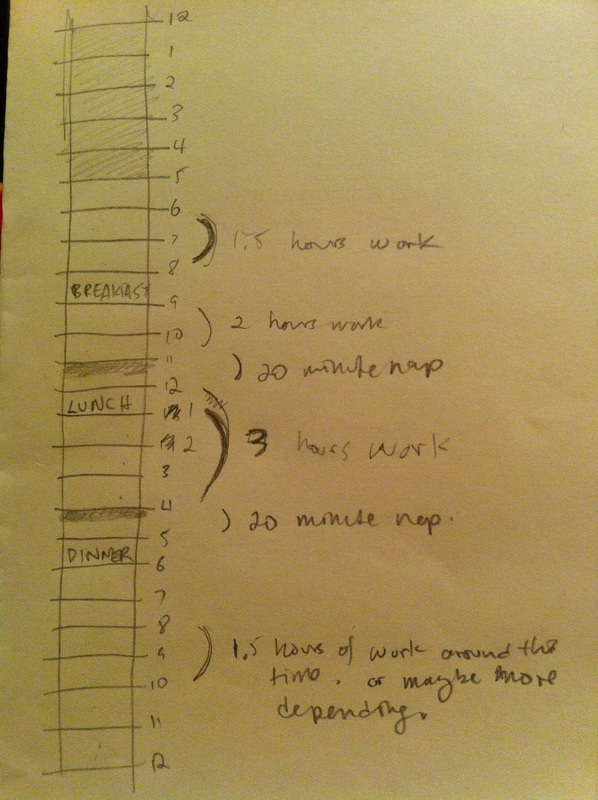 It seems somewhat crazy but here’s the polyphasic sleep (and work) schedule I’m going to try and adopt. That’s 4.5-5 hours of sleep at night, a 20 minute nap before lunch, and a 20 minute nap before dinner, with room for 8-10 hours of work (depending on my mood and busy-ness), and lots of family time. And lots of room for flexibility. Hopefully it works out. I think the somewhat less crazy biphasic sleep schedule I’ve been keeping (6 hours of sleep at night plus an afternoon nap) has prepared me well for this. Plus, thanks to my team meetup in NYC this schedule looks relatively luxurious. Your nap times are pretty near to mine, although I tend to be flexible with mine. #1 in the 10am-1pm range, #2 in the 4-5:30pm range, occasionally as late as 7:30 if the day’s activities call for it. The flexibility allowed by this schedule is key for me: it should be serving my life, not become it. You’re missing a golden opportunity for 2nd breakfast, which usually occurs around 9:30. Mr. Strider frowns upon second breakfast. This whole schedule is pretty anti-hobbit isn’t it? Do you ever have trouble falling asleep for the short naps? Or are they mainly resting times and not necessarily “real” sleep? No trouble so far. 20 minutes is the required time for the schedule and it takes 7–10 minutes to fall asleep for the average person so the 30 minutes I’ve blocked out covers it. Sometimes you get woken up early or can’t get a full nap in. That’s OK. I don’t know anyone that gets a precise amount of sleep everyday.